Kevin was born and raised in Raymond, ME. We met each other while attending the University of Maine in Orono. After college he went to flight school at Fort Rucker, AL. We got married in 2006 while he was at flight school. After he graduated we bought a house in Attleboro, MA (my home town). He then was deployed to Iraq in March 2008 with the Maine National Guard C Co. 1/126th AVN – Bangor, ME. After he returned home he changed units to the Connecticut National Guard 1109th TASMG – Groton, CT. He was then deployed with them in July 2012 to Afghanistan. Kevin struggled with PTSD since his first deployment. He took his own life in September 2015. Our marriage endured two difficult deployments but what was even harder to endure was watching Kevin struggle with the invisible wounds that he came home with. Kevin was the most amazing person I have ever had the privilege of knowing. I never want to be sad of what could have been but I want to cherish what we did have. We were blessed with two daughters; Brianna who is 5 and Amelia who is 1 ½. They are the joy of my life, they keep me grounded and focused. Maine has always been a special place for our family. I was born and raised in Massachusetts but I love Maine. I feel everything happens for a reason and if it wasn’t for the University of Maine I would have never met Kevin and I would have never had my two beautiful daughters. As difficult as this time in my life is right now I know without a doubt I was meant to be with Kevin. Even though our time was cut short I am a better person for loving him. I want our children to know just how amazing their father was and how much he loved our country. As most of you know I met Kevin in college. One look at Kevin’s smile and I knew my life would never be the same. Our first date was dinner and a movie. When he took me home from our date, I remember saying to my roommate “he’s a keeper.” When Kevin and I were together it was almost like no one else existed around us. The time came in our relationship when Kevin proposed and it was time to decide if I could be an ARMY wife. I knew it wouldn’t be easy but, I also knew I would rather be with Kevin when I could; than not be with him at all. We planned our wedding when Kevin was away at flight school. I was able to get a glimpse into what this life would be like when the Army informed Kevin that he might not be able to make it home for our wedding. By the grace of God it all worked out and I was able to marry this wonderful man. In what felt to be a blink of an eye the time had come for Kevin to embark upon his first deployment. This was to be the first of two deployments. Kevin and I would often remind ourselves; love doesn’t mean being inseparable, it means there are times life’s challenges will separate us, but our love would always be unchanging. When we decided to have children we were both terrified but we knew that this would be one more journey we would experience together. God blessed us with our daughter Brianna on November 12th 2010. He then blessed us with our second daughter Amelia on July 22nd 2014. Kevin loved our little girls so much as they meant the world to him. He would do “projects” with Brianna all the time. Still to this day, I didn’t always know what they were doing but I do know that there was always lots of laughter. They were two peas in a pod. When it came to Amelia, there was a soft spot in Kevin’s heart. Amelia would wait with anticipation for his arrival home every day. As soon as he would return home from work she would scream with glee and say “Hi”. Kevin’s heart would melt and he would smile and pick her up with tears in his eyes kiss her and tell her he loved her. Kevin was the most wonderful man I have ever known. He had one of the biggest hearts with the most genuine smile. Those of you who know and love him, know what I am talking about. I feel honored that he was not only my husband and the father of my children but my best friend. Anyone who knew Kevin knew he was a hugger. I can hear him now with his arms wide open saying “bring it in, come on bring it”. He just had a way about him that brought balanced to my life when I needed it the most. I am going to miss Kevin every single day for the rest of my life. But I feel privileged that we got to spend the last 11 ½ years together experiencing all that life had to offer us. I will always remember Kevin for his witty sense of humor, his adorable smile, his amazing cooking, and unconditional love for me, our children, family and friends. His horrible taste in music, his passion for flying and his enormous heart. Kevin was a man of integrity in everything that he did. One of Kevin’s dear friends sent me this Bible verse and it has given me some comfort; I hope it will do the same for someone else. Kevin my wonderful husband and love of my life. Find comfort in the arms of our loving Father until we meet again. Rest in peace, I will miss you all the days of my life. Your loving wife Amy. Kevin Dean Ouellette, 34, of Farmers Lane, Attleboro, MA died unexpectedly on Tuesday, September 8, 2015. Kevin was the loving and beloved husband of Amy Beth (Gaouette) Ouellette, to whom he was married on September 23, 2006. Born on June 29, 1981, he was a son of Paul and Georgette (Moreau) Ouellette. A resident of Attleboro since 2007, he was a graduate of Westbrook (ME) High School, Class of 1999, and in 2004 received a Bachelor of Science degree in Mechanical engineering from the University of Maine Orono. 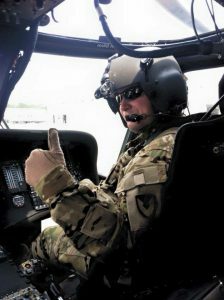 Kevin proudly served our country as a Company Commander, Detachment Commander, and Captain in the U.S. Army, with a primary specialty in aviation. He also served as a member of the Army National Guard and as a MEDEVAC helicopter pilot with the U.S. Army and Army National Guard. His distinguished military career was recognized by having been awarded the Afghanistan Campaign Medal with Campaign Star, Meritorious Service Medal, Air Medal, Army Reserve Component Achievement Medal, National Defense Service Medal, Global War on Terrorism Expeditionary Medal, Global War of Terrorism Service Medal, Iraq Campaign Medal with Campaign Start, the Army Service Ribbon, Overseas Service Ribbon, Armed Forced Reserve Medal with M Device (2nd Award), the NATO Medal, and the Basic Aviator Badge. Until his untimely passing, Kevin worked as an Account Manager with MSC Software. He was a member of the Community Covenant Church in Rehoboth, MA, Kevin had a love for anything and everything that was radio-controlled, including boats, cars and helicopters. He was an avid bike rider and boater, and loved the water, particularly time spent on Crescent Lake in Raymond, ME. He held a pilot’s license and loved to fly small planes and helicopters. Kevin was an excellent chief. Treating his family to delicious gourmet meals. He also had a passion for techno. He was a DJ throughout college called SPK. Kevin wore his heart on his sleeve. He always had a smile on his face and a laugh that was contagious. He cared deeply for his many good friends. His greatest love, and proudest achievement, was his family, his wife, and his two treasured daughters; Brianna and Amelia. Over 4th of July weekend my children and I were able to visit my in-laws (Kevin’s Parents) at their house on Crescent Lake in Raymond, ME. In the lake there was a big rock that had cracked during the winter and a piece broke off. Kevin’s sister, Kellie found the piece that broke off and we all thought it was the perfect stone to honor Kevin with as a part of The Summit Project. Kevin loved being on the lake. Next to flying it was his happy place. He had a love for boats, jet skis, kayaks, surfing. Anything where he could spend time in the water was where he wanted to be. Kellie called the stone “the missing piece”. How true that is. Our lives will never be the same without Kevin. He is our missing piece. thank you for this tribute… Kevin worked with me in Raymond with the RED program. He was also my nephew’s (Josh Robbins) dearest friend. Kevin’s smile was contagious, his excitement beyond measure. I remember the summer he helped the kids make rockets and shoot them into the sky. I also remember when he came to Jordan Small on one of our career days and he spoke to our kids. What a great honor and blessing to have had him in my life for that short time. RIP sweet Kevin! What a great tribute! I had the pleasure of knowing Kevin at a young age. I am one of the kids in the RED program that Joni spoke about in the previous comment. I enjoyed spending time with him hanging at the lake and of course building model rockets as well as the countless adventures we had at the RED program. I remember Kevin’s smile and his jokes like it was yesterday. Big smile and his positive energy is what I will remember most about him. All around stand up guy that would help in anyway he could. Kevin you will be missed by man and I hope you rest in peace. Kellie I wish you the best during this tough time in your life and i hope that you can find peace as well. It truly was an honor to carry Kevin’s stone for the first time. Having you all there made it even more special and emotional for me. Kevin really was an amazing son, father, brother, and husband. It’s crazy to me to be in this situation though. Looking back to when I met Kevin I would have never imagined that I’d be sitting here writing this. From the first time I met Kevin as a freshman at UMaine, it was instantly clear to me how genuinely great of a person he was. I could always count on him as my RA to make me laugh. He always had his door open and was so welcoming of everyone in Hart Hall. The more we talked the more I realized how we connected through our love of aviation. When Kevin joined ROTC, I was pretty stoked to have someone else in the program who enjoyed keeping the mood light and could find humor in just about anything. Within the Army there’s no shortage of people to take things serious and there was no better stress relief than having Kevin around. I could always look to him when I was getting upset to ground me and remind me that we can find humor in everything. I know that others in our class leaned on Kevin for that reason too. He wasn’t the typical gung-ho type of leader. He led in a different way, he showed compassion for everyone he interacted with and had the ability to connect on a personal level. I never got to see him around his daughters but I have no doubt that he handled fatherhood in the same fashion. Even after Kevin’s passing he has helped me through some rough times personally. I wouldn’t be where I am today without him. I wish the lessons that he taught me had come in a different way, but know that Kevin is still making a difference in people’s lives and he always will. Kevin, you were self-less. You may not have realized it but the efforts you made to make everyone else happy had such a large impact on everyone that you met. You gave your all to bring happiness to people around you through your smile, humor and unforgettable impressions. I wish I had the opportunity to give you the same. I know that you have found peace. I think of you often, I always will, and I know you left a mark on everyone from our ROTC class and of course many others. Thank you for giving me the opportunity to build a relationship with your family. I look forward to learning even more about you through them, and through others that carry your legacy. I had the opportunity of hiking Streaked Mountain while carrying the rock that honors Kevin Dean Ouellette. I learned about his loved ones and the different places he was deployed to. I found out that Kevin was a very nice man that had a contagious laugh and a genuine smile. Learning about Kevin was great. I’m glad I got the opportunity to learn about him because I have loved ones that also have suffered from PTSD. From reading the letter that was written by his wife, Amy, I learned that he attended the University of Maine Orono. He also went to flight school at Fort Rucker after college, and he got married in 2006 while attending flight school. They had two beautiful daughters that he loved very much. Kevin was a very loving and caring man towards his family. Anyone who had the privilege of knowing him, knows that this is true. Kevin loved to be on Crescent Lake in Raymond Maine. It was his favorite thing to do next to flying. Learning this was very cool for me because my family also owns a house on Crescent Lake and we all love to be on the water as much as possible. The rock that his family found for the Summit Project was perfect for Kevin. I thought it was a great representation for Kevin because it showed his love for the lake; his happy place. Carrying Kevin’s rock was an amazing experience for me. I am not the most athletic person in the world so climbing the mountain was a struggle. I complained a lot, but when I got to the top it was all worth it. I also realized I was being selfish, because that hike was nothing in comparison to what the soldiers do for our country. I would love to have had the privilege of meeting Kevin. He sounded like an amazing man. Thank you for giving me the experience of carrying Kevin with me to the top. This ment so much to me to hold his stone and walk with it, my great granfather was in world war 2 and I was one when he past away, I was so touched by his story and he seem a great father to Brianna and Amelia and I think he goes with you were ever you go. He will always be with you and never leave your side.he would grow up to be a great father and you would have had a great time growing old together. You will take great care of your two daughters and never forget that he will always be with you. I felt that the stone of Kevin’s was his soul and that I was caring him. On 22April, I was one of four athlete friends that joined up to participate in the 1stLT Zimmerman Fitness challenge at the UofME in Orono. While the four of us were experienced TSP hikers, most of us had never participated in an event like this one. So there was a bit of unspoken apprehension leading into it (at least for me). During the event itself, the team shared the honor of carrying the stones of Army aviators CPT Jay Brainard and CPT Kevin D Ouellette. This was my first time to carry Kevin’s stone. I’ve worked with his father Paul for several years, and now I happen to live near to his parents. I’m glad that this event became “the right time” for it to happen. While I had Kevin’s stone in my ruck, I could feel the weight and the “push” to keep moving to the end. I also kept recalling the big smiles in his TSP site photos and imagined that he was encouraging us along the trails that day. Through nearly 3 hours of rain, mud and physical challenges, our team of four remained good friends, helping, joking, laughing and smiling as we made our way along the course. Knowing that the goal was to be out there honoring his memory helped us to keep perspective and keep it loose. And I think that we all finished with big smiles on our faces to prove it. My journey with Capt. Ouellette began with the long awaited email from TSP with our stone assignments. I immediately went to the TSP website to get a quick introduction and glimpse at the Hero whose stone and story I would carry at BSP 2017. 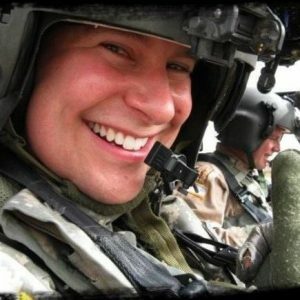 My first thoughts were “What a smile!” But as I read the beautiful words written by his dear wife and best friend Amy, I knew it would not be a simple or easy experience to learn about Capt. Ouellette. I would be going to a dark, sad place with nightmares, anxiety and isolation. During my training for the hike, as is my way, I collected a small rock on the trail at Douglas Mountain in Sebago to carry as a symbol of the Hero’s Stone. It felt good in my hand, this tangible piece of Earth that I would carry in my pack up The Owl, and that would later live on my dresser as my daily reminder of Capt. 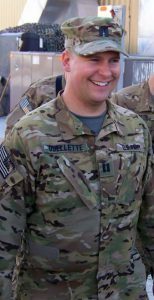 Ouellette’s life and sacrifice. On my next weekly trip to Douglas, I left that rock in my car. I went off the trail for ½ mile and had to back-track. Every other trip went error free because I knew Capt. Ouellette “had my six”. A few times at the switchback, I stopped and just knew something wasn’t right. I know it was him helping me find my way. I looked up into the trees and sky and thanked him. Each time I reached the summit of this humble peak, I looked off to the distant Crescent Lake where Capt. Ouellette spent so much of his time, and where his family found his stone. The forecast for the hike up The Owl was for sunshine and a light breeze. However, we left base camp at Twin Pines with overcast, damp conditions at 0600. I think the grey skies were a better match for the moods and mission of the 11 members of Team White. We traveled by van to the trailhead and began our ascent. The trail rose gently through the quiet woods, but about 1 mile in, the roar of Katahdin Stream Falls reached our ears. Team White had decided to visit the falls on our way down, so on we continued. As we increased elevation, the sky also brightened. We followed the trail alongside the stream, strong for its rain and melt, the woods thick and green. I was able to reflect in the quiet about what I had learned about Kevin. That he had a contagious smile, and a self-less, compassionate leadership style, that made a difference in the lives he touched. He loved to cook, laugh, and spend time with his family and friends. The only things that matched his passion of flying was his love for his family and spending time at his home on Crescent Lake where he spent many happy days on boats, jet skis, and kayaks. He met his wife, Amy, while in college at UMaine, and they were blessed with two beautiful daughters, Brianna, now 6 and Amelia almost 3. The journey continued, glimpses of a view spurring us on. Team White worked well together. Easy and friendly. Refreshing and enthusiastic. It was a pleasure to hike! As a Team most of us crossed Katahdin Stream and stayed dry. Then all at once, a outcrop, and a spectacular view of Mt. Katahdin and the valley sprawled before us, covered in the low clouds of our departure. It was so breathtaking to be above the clouds, like in an airplane. And to Kevin my thoughts returned and the young family left behind. And to the stone I bear with Kevin’s initials that came from his beloved Crescent Lake, a piece that had broken off a big rock over the winter. His sister Kellie called this stone “the missing piece”. The weight in my pack, just a grain of sand compared to the burden carried by Kevin and his loved ones. The gentle accent was behind us, replaced with steep, rocky terrain. As we scrambled and pulled ourselves and each other over boulders, we were followed by the call of songbirds. I stopped a few times, but I never caught sight of our cheerful friends. We made our way to the false summit of The Owl and caught sight of Team Red. We began our way up to the true peak and were awed by the warmth and sunshine with the gorgeous view laid out before us. The time had come for the sharing circle. Our Team White was comprised of six new participants with TSP. I was so moved and proud to hear the stories of their Heroes. The Circle is always an amazing and cathartic experience, but the first time can be overwhelming and intimidating. Perhaps the closeness to Heaven inspires us all. I asked my Team to take a moment to look around at our surroundings and cherish the moment. As ever, I knew what I wanted to say about Kevin. I even had notes in my hands. But what came out was an impassioned plea for understanding and reaction to PTSD. It’s effect on the millions. Millions who suffer with this illness, and the loved ones who so often feel powerless to help. I spoke of Kevin’s service to his country, and the price he paid. I spoke of his beloved family and the stone I carried. I had read so much over the past weeks and my heart was heavy. I hope I honored Kevin and the millions on the summit of The Owl that day. The hike down was a challenge. I had anticipated the stress on my legs, so I went slowly. When I noticed myself uttering a complaint, I remembered the stone in my pack. Kevin had my six, and I had no reason to complain. My team members were never far and always offered a hand, and I was grateful. We met 2 hikers from Team Blue who joined us on our decent, and made our way back down the trail. The detour to the Falls offered a refreshing view, and confirmation the trail end was close. The hike was comfortable and friendly, as was the ascent. At the trail end, we were met with cold water, treats and the friendly welcome of Larry, a Gold Star father. His smile would have been enough, but his tribute and display brought tears. We loaded the van back to Twin Pines, and to the exchange of the Stones. Since the 4 teams (3 to The Owl and 1 to Baxter Peak on Mt. Katahdin) were staggered on the trail, the Circle was just for our Team. The young man who received Kevin’s stone gave me one of the best hugs of my life. I learned later his name is Donny Rafford, and he served in Kevin’s unit. I began this essay stating that I started a journey. It began with Kevin’s smile. It traveled to Douglas Mountain in Sebago during May. On Memorial Day weekend it rolled out of the parking lot of the Portland Elks Club in the packs of the Summit Riders, with the echoes of The Pledge of Allegiance and The Star Spangled Banner from the local Girl and Boy Scout Troops in our ears. It met more power and wheels at Dysart’s. It carried its way through the town of Millinocket with waves and cheers. For me and my new TSP friend, driver and roomie, Cherie, it took a detour to the Maine Veteran’s Cemetery where volunteers placed flags at the graves of the fallen. The journey traveled through the hearts of the people I met who knew Kevin, and of those who are touched by PTSD: hikers, Gold Star families and volunteers. It went up a mountain, where it was spoken and shared. The journey for me is not over, although I sit at home. Each morning I see the small rock I picked up and the journey continues. It is my hope that what I have learned will help me raise PTSD Awareness, because I believe the journey continues for me there. Thank you for leading me there, Kevin. And thank you, Amy and family for being courageous to share Kevin’s story. I had both the honor and privilege of carrying Kevin’s Stone at TSP-ANG 2017. I actually hiked the same trail with a different stone the week before. Some people would think that a hike on the same trail and within’ 7 days of each other wouldn’t be much different but they would be wrong. Based on feedback from others who hiked Kevin’s stone, I decided to take the precaution and wrap it with a few layers of clothing. Although he was not able to push me with the point, he did push me on more than one occasion. Kevin accompanied the team and me to two peaks that day. The first was Pemetic Mountain. It was windy and visibility was not the greatest due to the low hanging clouds. This definitely intensified the somber feelings that I was having at the moment. On the way down towards Bubble Pond, we passed another group of hikers that were going up towards Pemetic. Several of them were wearing Red Sox hats and at least one of them was wearing ‘Boston Strong’ attire. I couldn’t help but wonder if they had been directly impacted and what their thoughts may have been to see our group hiking with the flag. Although it is tuff for the people who wear the uniform to leave home, they do so to prevent things similar to what happened in Boston on that day. Once we reached Bubble Pond, we all took a break and took the opportunity to visit the facilities at the parking lot. I reflected back on the story of where Kevin’s stone came from. I decided that it was only proper to place it near the water and take a picture of it. We reached the top of Cadillac Mountain and chose an area off to the side with natural wind blocks to reflect as a group where Kevin’s parents joined us. I find it much easier to write than speak so this letter will likely be longer and I hope both of you approve of these words. We all then posed for our group picture where we were all pointing North. Kevin once again accompanied me to the official summit marker. It’s been 2 weeks since I hiked with Kevin. I have since reflected back to both my hike and Kevin’s story when either the aircraft, parts or maintenance crew has not gone as planned. Last week I went to a fast food place to pick up lunch. I decided to deviate from one of the two items that I would normally get and tried a new item from the menu. When I was asked which sauce that I would like with the chicken strips, I decided to choose the sriracha sauce. This normally would not be my first choice but it definitely would not be my last choice either. As I ate lunch, I couldn’t help but wish that I had also asked for Sweet and Sour as a second choice. The sriracha was good but definitely had some kick. Although I would have preferred the sweet and sour over the sriracha, I couldn’t help but think that the sriracha sauce would be excellent with scrambled eggs and wondered how many food combinations Kevin may have made using it as an ingredient. We live close to a lake and like to kayak. I know that anytime that I either see rocks near the shore line or a jet ski that I will think of Kevin. I know by reading Kevin’s story and briefly meeting with his parents that he was loved and that they will always miss him. This will never change but I truly hope that his passing will get easier over time. The Summit Project, TSP at BSP May 2018 was to be my first experience with TSP. I received an email on March 5th that I would be a member of the White Team and hiking the Owl. Over the next month I received emails and became part of a facebook group for Team White. I waited in anticipation for my assignment. I was excited and very nervous, not sure what to expect. On April 10, 2018 I received my long awaited assignment, I would have the honor and privilege of carrying the story and stone of Army CPT Kevin Dean Ouellette. I quickly went to TSP Honors page to learn all I could about Kevin. Amy, your words were my first introduction to Kevin. I have read them many times over, the past few weeks. Each time I read them I learned a little more about Kevin, as a man, father, brother, friend and hero. I could sense your love in every sentence. I read the words of previous stone carriers, classmates, friends and family. I was drawn to Kevin’s smile in the photos, the stories of his: working as an RA at UMO, as the leader and mentor in his ROTC Unit, volunteering with students in the RED program at a local school, his love of flying, cooking for friends and family, summers at his beloved Crescent Lake in addition to his distinguished military career and the PTSD that haunted him after his first deployment. The weekend of May 27th arrived quickly and I continued to be nervous, excited, and full of anticipation. I stood among Gold Star families, fellow hikers and other TSP volunteers when the motorcyclists arrived at NEOC carrying the Honored stories and stones. I still can not fully describe the flood of emotions I felt at that time, and throughout the next couple of days. I listened as the riders stated their names and the names of the Hero’s’ stones and stories they were carrying and the handed them to family members or hikers. Kevin’s name was called and I was presented with his stone, sharing a quick hug with his rider. Holding his stone, the story of Kellie retrieving the broken piece from from the boulder in Crescent Lake was in my heart. I placed Kevin’s stone among the others and returned to listen and watch as the remaining stones passed hands. Saturday evening we met for our hiker briefing and as we left the meeting we each left with the stone of our Hero. I felt as if Kevin and I had finally met. I had be speaking to him for weeks, but, now there was so much more. Again, I can not find the words. Sunday morning came early, Team White was to meet our van at 6:05 am. We loading in the van and heading the the Katahdin Stream Campground and the trailhead. Many photos were taken as we started out, the weather was beautiful and the company could not have been better. I focused my thoughts as we hiked on stories of Kevin helping others. I pictured him launching rockets with school students, listening to and mentoring fellow college students at UMO as an RA and ROTC. I wondered what he and Brianna were doing and laughing at during their “projects” and visualized the smile on Amelia’s face as Daddy came home. I thought of the love that was shared between Kevin and you Amy. Every story that stayed with me as I hiked was about all of the people that Kevin helped through hard times. I could not help but wonder, how could we as a community, a state, a country have helped him more with his struggles with PTSD. The group stopped often, but when we started hiking again my mind would return to Kevin. Both, to his joys as well as his struggles. We helped each through some of the more difficult stretches of trail, both physically and mentally. I sensed Kevin there with us, helping and encouraging us on. Once on the summit, the 12 members of Team White gathered and shared a beautiful circle with stories, song and promise that our heros would not be forgotten. So many, amazing Maine Heros. As I attempt to pen this a few days post hike, I still find myself struggling with articulating how much of an honor it was for me to carry Kevin’s stone and story. I find myself talking about him with anyone who will listen. Thank you, Amy and the entire Ouellette family for sharing your stories of Kevin. I feel as my mission with Honoring Kevin, TSP and PTSD awareness has just begun. I was honored to carry Kevin’s stone up Mount Battie and share in his memories that I will carry for a lifetime. I want to thank his wife, Amy, for speaking with me about their beautiful family, specifically the importance of letting our soldiers and loved ones know that it is always okay to ask for help. It is clear that Kevin and Amy share a special bond and I am amazed by her strength. Like Mike Keighley and other Black Bears, I was fortunate to be Kevin’s fellow cadet at UMaine Army ROTC. Kevin was truly special and stood out from the rest with his amazing smile, incredible humor, humility, and his ability to connect with and lead his fellow soldiers through compassion and a calming confidence that always put everyone at ease. He did have terrible taste in music though, I mean really bad. I always enjoyed my time around Kevin and I cannot think of a bad memory. He just always made everything brighter which makes it all the more difficult to understand the complexity of PTSD and that no one is immune. I lost touch with Kevin after commissioning in 2006 and was devastated and shocked by his passing. It is an event I would have never predicted. In carrying Kevin’s stone up Mount Battie I recall feeling the weight of his stone while seeing the beautifully rugged Maine coast created from the glaciers that at one time weighed heavy on the landscape and led to the rebirth of what I was now seeing. It made me think of PTSD and the incredible weight that our soldiers carry and how it reshapes them and their loved ones. Even under all of that weight many of these soldiers so use to pushing themselves to the extreme are unable to ask for help. It is not because they are weak but because they are so use to being strong for everyone else. As a father of two beautiful twin girls Kevin’s story weighs heavy on me and makes sharing his story all the more important. It is clear that Kevin loved his family and had a special bond with his children. We all need to do our part to learn more about PTSD and what we can each do to help those with these wounds. We need to fight for these soldiers and ensure that they get access to the help they need and that we create a environment where they know they can ask for help. This past September 29th, I was the steward of Kevin’s stone for the day. It was my responsibility, or rather my privilege to carry his stone and story with me as I ascended Cadillac Mountain. Several weeks beforehand, I thought about what the day would be like. I knew Kevin, not as others had known him…not in life; but I had learned about him through the eyes of his family. Through you, I got to know Kevin. Thank you for sharing him with me. He had a passion and drive to become what he had always dreamed of being; a man who flew above the ground, above the world, joined with the birds, the wind, the sky. Peace. You allowed me to see what you saw…a smile to lift the heaviest heart, a sense of humor to lighten the mood when it was needed most, a desire to live life on the edge of chaos, but in control. An obstacle was not an obstacle to Kevin, it was a challenge to overcome; an adventure to be had. I had stowed Kevin’s stone and card in my pack before we stepped off on our hike. It was a beautiful, clear fall day…one perfect for flying; Kevin would definitely have been up today, I thought to myself. Not long after we set off I realized that Kevin is not one to look behind him but to see the path ahead and attack it with all that he had. At that moment, I stopped, removed my pack, unzipped the compartment where his stone and story were carefully stored and I removed his card.I looked at his smile and thought to myself, this is not a soul who would want to look at what is behind us on the trail, but instead he would want to see what was ahead; the obstacles and challenges, calling them out for those who followed, making their path easier. I tucked his card into the waist strap of my pack and he stayed there for the rest of the hike. We remained at the front of the hike, sometimes right behind ‘Old Glory’ and sometimes just a few back to lend a helping hand to others overcoming a steep grade. That was not me as much as it was Kevin. I only hope that I emulated that day, the spirit and strength that Kevin possessed in life and the inspiration that he provides while he flies the skies with angels. Thank you for sharing your Hero with me. He will stay with me through all my days in this world and help to lead me to the angles when it is my time to fly.